From Safety Roadhouse to Nome the trail runs along the Nome-Solomon Road except where it passes around Cape Nome and the last seven miles into Nome. Here the trail parallels the road on the right side and presents no obstacles. 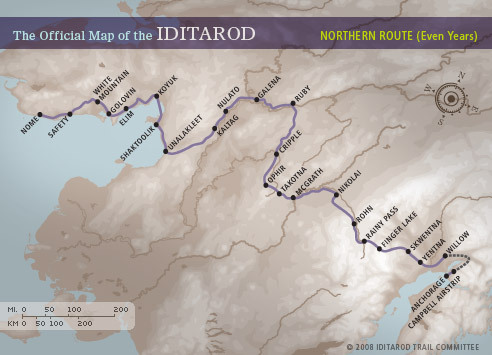 Nome — (OME) Lat 64.30 Long 165.24 — Population 3,695 — The end of the Iditarod Trail! Prospectors established this Seward Peninsula city as Anvil City after adjacent Anvil Creek in 1898. A year later gold was discovered in beach sand, and it became a boomtown, home of 30,000 gold seekers. The city was renamed Nome in 1899 after a nearby point on Norton Sound, which got its name in 1853 when a British Navy cartographer misinterpreted a chart notation of “? Name” and recorded it as Nome. The gold rush atmosphere still abounds, especially when “Iditarod Fever” hits town with the entire community turning out to welcome the mushers and visitors alike to their community. Numerous stores, restaurants and bars line Nome’s infamous “Front Street”, but lodging is at a premium. If the Nugget Inn and Polaris Hotel are full, check with the Nome Convention and Visitors Bureau for the availability of “bed and breakfast” accommodations.